A FIRST FOR THE BOA BASEMENT, IT WAS ONLY A MATTER OF TIME. 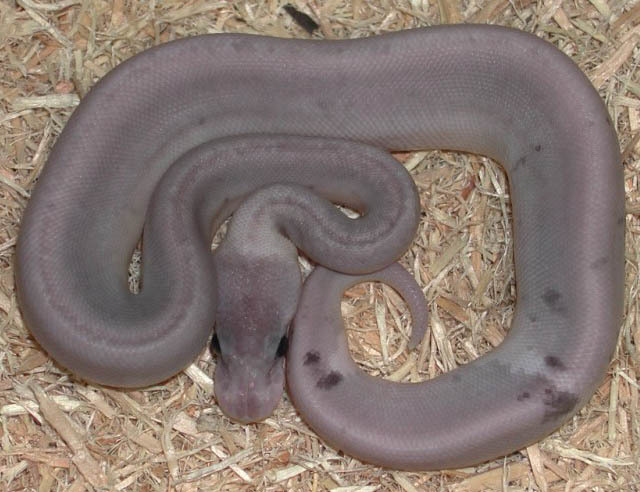 This genetic power house hatched out on 8/28/08 right here at the Boa Basement from a breeding I did with my 07 male silver streak bred to my 06 female pewter, (cinnamon pastel is used for all my projects). The clutch consisted of 6 eggs of which hatched out were 1 pastel jungle, 2 pewters, 1 silver streak, 1 silver bullet and 1 SUPER PEWTER. Oh yeah, he is a boy so he will have lots of girl friends in his life time. What does it mean to be a super pewter? It means it is guaranteed to throw 100% pewters every time no matter what he is bred to, he brings that guarantee to the table. Breed him to a super pastel and you are guaranteed 100% silver streaks every time, breed him to a super cinnamon and you are guaranteed 100% silver bullets every time. Not bad to be a duel dominant gene carrier. Of course we will breed him into a host of other mutations and see what pops out.